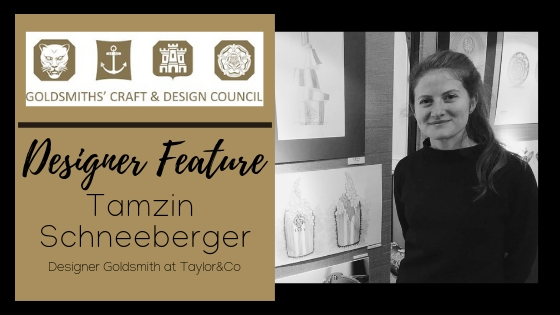 At Taylor&Co we pride ourselves in supporting emerging artists and we are excited to announce that one of our designer goldsmiths – Tamzin Schneeberger – has been featured in the Goldsmith Craft and Design Council Awards exhibition. Fondly known as the ‘Oscars of the Industry’ the Goldsmith Craft and Design Council awards have helped launch the careers of many renowned craftsmen and designers, rewarding their exceptional technical skill and design abilities in both 2D and 3D categories. We are delighted to announce that two designs by one of our in house designer goldsmiths, Tamzin Schneeberger, were displayed at the GC&DC exhibition at Goldsmiths’ Hall from 26th February to 1st March 2019. Congratulations to Tamzin from all of us at Taylor&Co!